Celebrate the life-giving force of our planet by enjoying a walk through the Garden this week, appreciating the gifts of nature, and finding small ways to conserve resources and protect our precious environment. 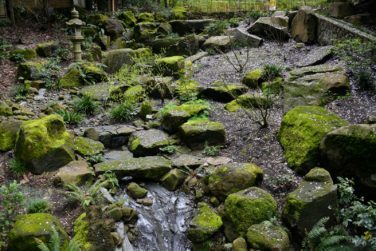 At Portland Japanese Garden this is done year-round, from the LEED-award-winning design of the new Cultural Village, to continually seeking out more earth-friendly practices Garden-wide. 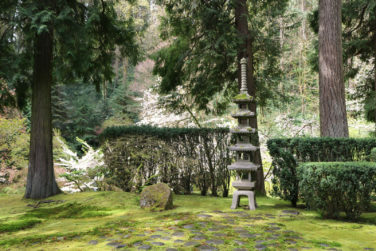 Portland Japanese Garden is proud to say that more than 50 percent of its staff does not drive to work, i.e. they carpool, take transit, bike, scooter, or walk. The City of Portland’s benchmark ration for a sustainable workplace is 20 percent. Reimbursement, raffles, and other incentives are offered to employees who bike, walk, or carpool to work. Of course, there is the ecologically-designed dry creek bed as you walk through the Entry Garden and the living rooftops lined with sedums on our new buildings in the Cultural Village (the project itself won LEED Gold certification earlier this year), but did know that Portland Japanese Garden has an employee “green team” that meets regularly? The group is made up of a half dozen employees and is supported by management in implementing sustainability efforts year-round. guests and koi. The gardeners have installed new water and irrigation lines throughout the garden abandoning old galvanized lines that leak. They have taken steps to reduce storm water runoff, select drought tolerant plants where appropriate, compost plant debris, use organic fertilizers, reuse all stone, and source soil amendments locally and sustainability – while only planting native trees. The Umami Café staff does not serve iced beverages with a straw unless requested by a guest and the straws provided are 100-percent biodegradable and made from corn. The Café uses only compostable bags and offers guests hand wipes, or oshibori, which are 100-percent biodegradable and plastic free. No additives are used, and the napkins are completely non-toxic. Seventy-percent of the Cafe’s food is locally made from Portland bakers and the remaining 30-percent from two locations on the West Coast (San Francisco, CA and Tacoma, WA). The Umami Café staff removed the kitchen printer where food orders were sent from the server computers to the kitchen. The removal of the printer conserves hundreds of rolls of paper a year. We now use a tablet to send orders to the kitchen. Overall, there is an architectural component to the Umami Café that was designed to foster calmness and tranquility by heightening guests’ connection and affinity to nature. 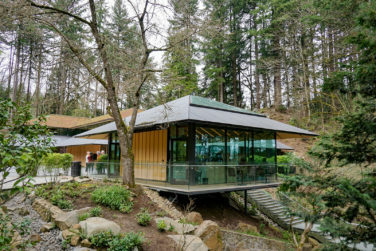 Café guests are still connected to nature where they can sit and drink a cup of tea underneath the glass skylight covered in Tyvek material to mimic fragile rice paper. The Garden Gift Shop is no longer selling plastic water bottles. 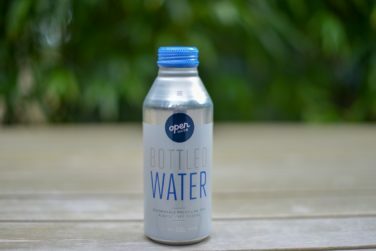 Instead, the bottles are made of aluminum because they are (the caps too!) infinitely recyclable. Aluminum is recycled more often than any other beverage container; more than twice as often as plastic, glass, and cartons. Its high scrap value helps ensure that even if you forget to recycle, someone else will do it for you. In fact, the scrap value of aluminum is what funds the majority of curbside recycling programs around the country. The Gift Shop also uses a paperless system for payroll and for its vendors and product packaging and shipping materials are reused, donated, or recycled.